Located just outside of Asheville, North Carolina. 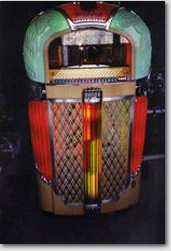 We offer service for jukeboxes (record & CD), pinball, slot machines, and video games. Restoration and extensive repair can be done in our shop. Please have machine name, manufacturer, and model number available and as much information about the problem as possible. The more information we have, the more likely your machine can be repaired in just one visit.